IODPâ€™s JOIDES Resolution has recovered PETM sediment cores during past expeditions. Credit:Â IODP. Red clay band in deep-sea sediment cores marks the onset of the PETM. Credit: J.Zachos. New research published today in Nature Geoscience by Richard Zeebe, professor at the UH Mānoa School of Ocean and Earth Science and Technology (SOEST), and colleagues looks at changes of Earth’s temperature and atmospheric carbon dioxide (CO2) since the end of the age of the dinosaurs. Their findings suggest humans are releasing carbon about 10 times faster than during any event in the past 66 million years. 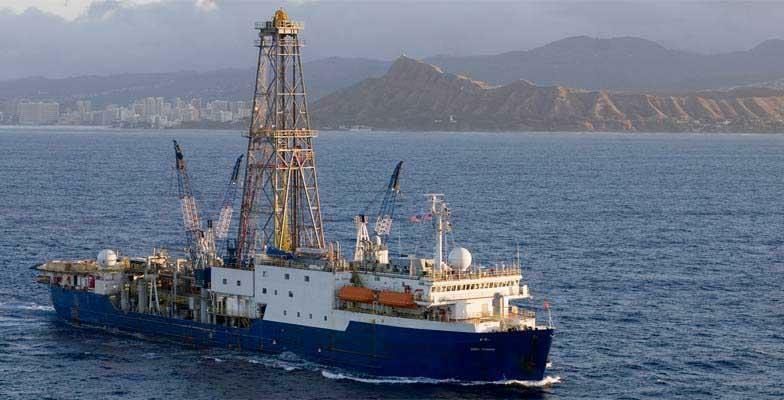 Zeebe and co-authors Andy Ridgwell (University of Bristol/ University of California) and James Zachos (University of California) combined analyses of chemical properties of PETM sediment cores with numerical simulations of Earth's climate and carbon cycle. Their new method allows them to extract rates of change from a sediment record without the need for an actual sediment age model. Applied to the PETM, they calculated how fast the carbon was released, how fast Earth's surface warmed, and constrained the time scale of the onset, which was at least 4,000 years. “Because our carbon release rate is unprecedented over such a long time period in Earth’s history, it also means that we have effectively entered a 'no-analogue' state. This represents a big challenge for projecting future climate changes because we have no good comparison from the past,” said Zeebe. “If you kick a system very fast, it usually responds differently than if you nudge it slowly but steadily," said Zeebe. “Also, it is rather likely that future disruptions of ecosystems will exceed the relatively limited extinctions observed at the PETM." Richard E. Zeebe, Andy Ridgwell, and James C. Zachos (2016). Anthropogenic carbon release rate unprecedented during the past 66 million years. Nature Geoscience, doi: 10.1038/ngeo2681. Funding for this research was provided by the U.S. National Science Foundation and the European Union.